Disc 8 of the Shostakovich series, conducted by Valery Gergiev, mentioned in my last post contains the performance of the above music recorded at the Salle Pleyel on February 18, 2014. 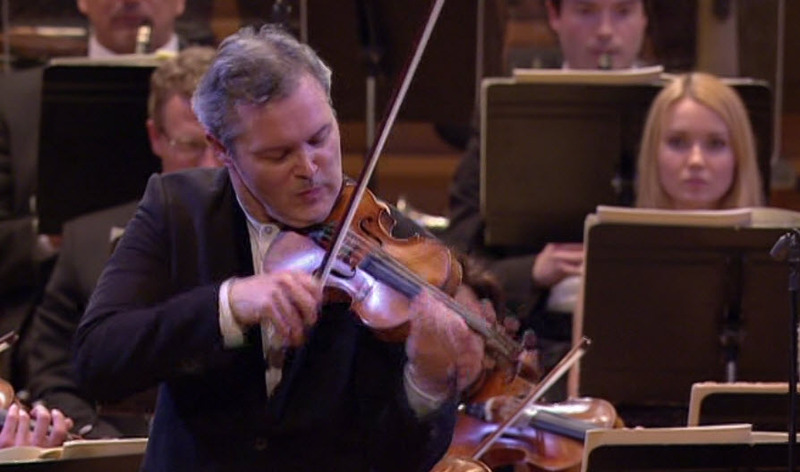 The soloist is the the great Russian violinist Vadim Repin. The first violin concerto (opus 77) was written in 1947-8. It was dedicated to David Oistrakh who gave its initial performance in 1955. The delay was the result of Andrei Zhdanov’s denunciation of Shostakovich and fellow composers Sergei Prokofiev and Aram Khachaturian. It was perilous to be good at anything under Stalin. The dictator’s death in 1953 (on the same day that Prokofiev died) relaxed the pressure on Shostakovich – at least a little bit – enough that the concerto could be performed. This concerto is the longest of the six that Shostakovich wrote. I heard Repin play the piece at Carnegie Hall about 15 years ago. Then, as now, he was in total command of a concerto which is among the most difficult ever written. This work is probably the first use by the composer of the DSCH motif – a musical cryptogram of Shostakovich’s name. Here is the Burlesque in its entirety. The concerto is a formidable piece that is now part of the standard concerto repertory. 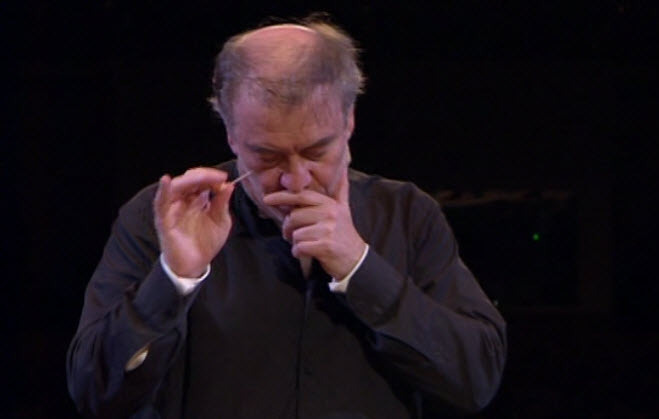 Gergiev leads the Mariinsky Orchestra in a vigorous reading of the concerto which has a great orchestral part. The conductor has taken to using a toothpick as a baton. I don’t know why, but it seems to work. The 11th Symphony is one of Shostakovich’s greatest achievements. It has not been performed as frequently as its worth demands. Part of the reason is that many early critics demeaned it as being too pictorial or even vulgar. In some quarters that view persists. Pay no attention – it’s a masterpiece. Imagine the greatest film score ever written and then throw away the film. Subtitled The Year 1905 it ostensibly is about the unsuccessful uprising in Russia during that year. The work is in four movements played without interruption. It contains quotes from 9 revolutionary songs which are integrated into the score. These songs would have immediately been recognized by the symphony’s Russian audiences. But like all great music it is not necessary to know the non-musical background to be fully engaged by the 11th Symphony. A musical masterpiece stands on its own. You can read into this score any external tragedy you wish. Some have thought that it was a reaction to the suppression of the Hungarian uprising of 1956 or to the Gulag. Give it any meaning you care to. As pure music it stands on its own. Here is the an excerpt from the 2nd movt which ostensibly depicts the massacre of the demonstrators before the Winter Palace. I’ve only heard this symphony in the hall once. Leonard Slatkin conducted the Chicago Symphony Orchestra in a performance that blew the roof off of Orchestra Hall. If you get a chance to hear it live don’t miss it. Gergiev gives it a great reading, but this is a work that demands that the listener be part of the audience. The video portion of this disc and the others in the series uses almost as many cameras are there are instruments in the orchestra. Rather than being distracting the various views are quite engaging.